Burton remained top of League One after beating promotion rivals Coventry. Visiting keeper Jon McLaughlin twice denied James Maddison in the first half, while Damien McCrory tested home stopper Reice Charles-Cook. But early in the second half Calum Butcher opened the scoring when he capitalised on a defensive error. Albion's Stuart Beavon hit the bar but then made no mistake in the 72nd minute when he latched onto Anthony O'Connor's long ball before coolly finishing. City's failure to win at home against League One promotion rivals for the second time in five days, following the 1-1 midweek draw with Walsall, now leaves them four points shy of an automatic promotion place. "Well done to them. It's difficult for us to take. It was going to be decided by a mistake. We knew that by half-time. "A mistake cost us ultimately. We're talking about concentration. We knew it was going to be difficult to get back into it. "We have to put it behind us very quickly, focus on the next game, and get back to winning ways as soon as we can." "We were nervous early on. We had this problem for the Doncaster game in December when we hadn't played for a while. "It took us a while to get going and it did again. Jon McLaughlin had to make a couple of very good saves in the first half. "But we were much much better in the second half. We scored the two goals, hit the bar and restricted them to very little." Match ends, Coventry City 0, Burton Albion 2. 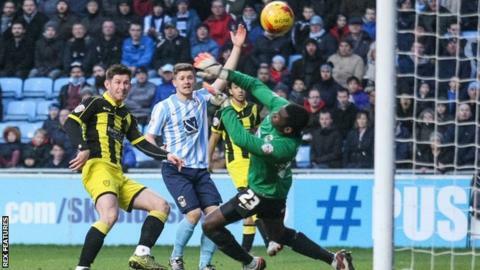 Second Half ends, Coventry City 0, Burton Albion 2. Corner, Burton Albion. Conceded by Peter Ramage. Anthony O'Connor (Burton Albion) wins a free kick in the attacking half. Corner, Coventry City. Conceded by Philip Edwards. Mason Bennett (Burton Albion) wins a free kick on the right wing. Substitution, Burton Albion. Callum Reilly replaces Callum Butcher. Corner, Coventry City. Conceded by Shane Cansdell-Sherriff. Attempt saved. Adam Armstrong (Coventry City) left footed shot from outside the box is saved in the bottom left corner. Attempt missed. Marcus Tudgay (Coventry City) header from the centre of the box is high and wide to the left. Substitution, Coventry City. Joe Cole replaces James Maddison. Goal! Coventry City 0, Burton Albion 2. Stuart Beavon (Burton Albion) right footed shot from the right side of the six yard box to the high centre of the goal. Assisted by Callum Butcher. Attempt missed. James Maddison (Coventry City) right footed shot from outside the box is high and wide to the right from a direct free kick. Adam Armstrong (Coventry City) wins a free kick in the defensive half. Attempt missed. Romain Vincelot (Coventry City) header from the centre of the box misses to the left. Hand ball by Damien McCrory (Burton Albion). Attempt missed. Mark Duffy (Burton Albion) right footed shot from outside the box is close, but misses to the left. Corner, Burton Albion. Conceded by Sam Ricketts. Attempt missed. James Maddison (Coventry City) right footed shot from outside the box is close, but misses to the left. Substitution, Coventry City. Gael Bigirimana replaces Aaron Phillips.